Context: An individualized approach of providing yoga support can address many of the disease-related concerns indicated in the management of diabetes, specifically the impact on other life activities and long-term functional wellbeing. Aim: To analyze the role of regular yoga practice as a self-management approach to achieve glycemic control and psychological wellbeing in Type II diabetic patients. Methods: Ninety-one subjects of both sexes responded to the announcement and consented to participate in the study. This was a single group, before and after yoga evaluation without control comparison. The fasting and postprandial blood sugar, glycosylated hemoglobin (HBA1c), cognitive tasks, depression, cognitive failure, and diabetic-related quality of life (QOL) were measured as pretest. The subjects underwent one-to-one individualized yoga therapy sessions, which included 12 supervised sessions spread over a 3-month period. The posttest data were analyzed using paired t-test and Wilcoxon paired rank test. Results: Showed significant reduction in fasting blood sugar. QOL of the diabetic patients had improved significantly. There was a significant reduction in the frequency (mean difference of 7.58,P > 0.01) of depressive symptoms and intensity of depression (mean difference 1.66,P > 0.05). Concentration and attention span improved significantly and mean discrepancy score reduced (mean difference 3.42,P > 0.01). There were no marked changes in the postprandial blood sugar and HBA1c. Conclusion: Yoga practice enhances the subjective wellbeing, QOL, improves mood and concentration, and facilitates achievement of adequate glycemic control among Type II diabetic patients. Keywords: Glycemic control; individualized approach; psychological wellbeing. India has the second highest number of people with diabetes in the world, which is expected to increase to 101.2 million by the year 2030. Diabetes is also beginning to appear much earlier in life in India, meaning that chronic long-term complications are becoming more common. Health care providers are vigorously addressing issues associated with diabetes management. From the perspective of the diabetic patient, he or she has to make many adjustments once the metabolic process is affected. The adjustments are to be made with lifestyle, enhancing psycho-behavioral resources to achieve not only glycemic control but also to take care of all associated problems that may crop up in the long run. Whether it is adhering to dietary regimen, exercise, mood stabilization, stress management, cognitive functional status or productivity, and the patient needs to be self-empowered. Lack of acceptance of disease, resistance to changing the food habits, and negative attitudes can affect the course of disease progress and lead to more complications. Among the many complications of diabetes such as retinopathy, neuropathy, nephropathy, and cardiovascular diseases, cognitive dysfunction has been one of the major issues, which needs to be investigated. Reviewing the relevant literature, researchers suggest the need for cognitive assessment in various stages of diabetes and also the requirement for intervention to maintain and enhance the cognitive quality of life (QOL) in diabetic care. A substantial body of research into diabetes has examined the effects of the illness on cognitive functioning. Diabetes mellitus and poor glucose control were associated with worse cognitive function and greater decline suggesting that severity of diabetes mellitus is likely to contribute to accelerated cognitive aging. Type II diabetes is associated with cognitive deficits, although inconsistently across neuropsychological domains. Researchers suggest that it is clinically and theoretically important to examine sequential changes in multiple domains overtime. Shuba and Karan  in their research findings state that diabetes is associated with lower levels of cognitive function. They report that by the early implementation of Mini Mental Status Examination, even a mild cognitive impairment can be detected so that adequate treatment can be given to prevent dementia. A new study by O'Connor  adds to growing evidence that the complications of diabetes may extend to the brain, causing declines in memory, attention, and other cognitive skills. A study by Yates et al. states that chronic hyperglycemia and associated microvascular disease appear to be the most important determinants of cognitive decrements in diabetes. Among well-functioning older adults, research findings by Nazaribadie et al., suggest that diabetic patients experience a decline in executive functioning and thus, monitoring neuropsychological status besides controlling levels of blood sugar in these patients is important. They also compared the cognitive functions of Type II diabetics and prediabetes group and evidence suggested a marked cognitive compromise in the clinical group. Yogic practices in diabetes management have been exclusively researched and the evidence supports its role in achieving adequate glycemic control. In most of these studies, glycemic control has been considered as the single critical outcome measure to establish yoga therapy effectiveness.,,,,,,,,,,,, Critical reviews of the studies have indicated some of the methodological concerns. The major lacunae are attributed to lack of randomized controlled studies, the short-term nature of yoga interventions, nonspecific therapy focus, and a lack of compliance with practices and a dearth of adequate sample size. Yoga-related studies in diabetic management point to the failure to monitor home practice, a large dropout in training sessions, and a failure to achieve a long-term follow-up. These problems are often detected as “lack of motivation” and also termed as “yoga being too much time consuming.” Researchers have also indicated that there are certain motivational barriers to yoga practices such as complexity of postures or instructions, lack of clear or specific course plan, lack of information on why certain practices are given, cultural barriers, nonspecific focus of training, too lengthy time involvement, and also fear of injuries. An individualized approach of providing yoga support can address many of these issues. Most of these issues can arise due to disease-related factors such as poor energy, lack of alertness, concentration, inability to learn new tasks, and failure to sustain the motivation. Having understood that cognitive functions are compromised in diabetes condition, it warrants an approach, which facilitates practice and improves the overall QOL of diabetic patients. If a connection between improved glycemic control and improved cognitive function is made, it might motivate patients to work more actively to manage the glycemia. Mood can also interfere with cognitive function. It is suggested that stress and negative moods are brought down by yoga practice, which increases the serotonin level in the body that is likely to facilitate the cognitive performance. Yoga therapy process involves a strong commitment to practice and also adherence to regimens related to lifestyle. The active participation of the subjects, taking responsibility to adhere to the personal practice, comply with the associated dietary discipline, and other lifestyle regimens are important processes of holistic yoga therapy for diabetes condition. An individualized yoga therapy is “therapy plan” aims to address the personal needs of the diabetic care seeker not only from the view of achieving clinical endpoints but also adopting a yoga practice for self-care. With the objective of achieving adequate glycemic control and also to address the associated cognitive impairments of diabetes “Diabetes Self-Management” a preliminary evaluative study was undertaken. Ninety-one subjects volunteered for an announcement of recruitment. The responders were given a brief orientation of the study objectives and explained participation requirements. Their consent was recorded. Their clinical status was assessed and a trained psychologist conducted the individual assessments. Only the consenting individuals with Type II diabetic were included and persons with any serious illnesses were excluded from the study. This is a “single group, before and after yoga” evaluation without control comparison and the subjects for the study were consenting volunteers. The primary focus was to analyze the role of regular practice of yoga as a self-management approach to achieve glycemic control and psychological wellbeing of Type II diabetic patients. The pretest was administered prior to intervention. QOL was measured through Audit of Diabetes-Dependent Quality of Life (ADDQoL) depression was measured by Beck's Depression Inventory (BDI). Cognitive failure was assessed using Cognitive Failure Questionnaire (Craig Wallace, 1999), and selected cognitive performances such as digit symbol substitution, digit span, and Stroop tests were measured as pretest. Postprandial blood sugar, fasting blood sugar, and glycosylated hemoglobin (HBA1c) were measured by the laboratory technician before starting the intervention. The following tools were used for the study. This is a 13-item questionnaire to measure individual's perceptions of the impact of diabetes on their QOL. The respondents are to rate the importance of life domain as well as the perceived impact of diabetes on the domain. The factorial validity of the questionnaire is well established. Reliability as reported by the authors is 0.86. The tool is sensitive to changes in diabetes status and interventions. The score ranges from + 9 to −9 with negative scores implying the most negative impact of diabetes on the domains of life. It is a 21-item self-report rating inventory measuring characteristic attitudes and symptoms of depression. The internal consistency (reliability) for BDI ranges from 0.73 to 0.92 with a mean of 0.86. The test-retest reliability ranges from 0.48 to 0.86 depending on the interval for retesting and the type of population. Various types of validity are also well established. BDI not only a screening and diagnostic tool but it is also used for evaluation of outcomes (Beck 1978). This 25-item self-report inventory is a measure of everyday task failures that individuals are normally capable of completing. It consists of four dimensions, namely distractibility, memory lapses, blunders, and memory for names. It inquires about minor mistakes and slips over the past 6 months. The subjects respond to items using a 5-point Likert point scale (i.e., 0-never, 4-always) and the score ranged from 0 to 100. The factorial validity of the questionnaire and its reliability is well-established by the authors. This is one of the subtests of Wechsler adult intelligence scale, 3rd edition (1997). A series of number each of which is paired with its own corresponding hieroglyphic-like symbols, using a key, the subject is to write the symbols corresponding to which measures processing speed. The time limit for the test is 90 s (2nd edition). This test assesses incidental learning and a digit symbol copying process, which is a measure of perceptual and graphomotor speed. The reliability coefficient ranges from 0.70 to 0.90 across different age groups indicating a high reliability of the test. It is another subtest of Wechsler adult intelligence scale, 3rd edition (1997). This test consists of a series of orally presented number sequences that the subject repeats verbatim for digit forward and in reverse order for digit backward. This subtest is an important measure of memory. The reliability coefficient for this subtest ranged from 0.79 to 0.85 across age groups and it is highly valid. It is a measure of cognitive flexibility. This test measures the response inhibition. When a “conflict” task is involved, the subject has to curb their natural and automatic response. Thus, it measures the ability to inhibit one response and spontaneous suppress of the other. Stroop consists of the colors, namely “Blue,” “Green,” “Red,” and “Yellow” are printed in capital letters on paper. The color of the print occasionally corresponds with the color designated by the word. The words are printed in 16 rows and 11 columns. The subject was asked to read the stimuli and the time taken to read all the stimuli are noted down. Then, the subjects are asked to name the color, which the word is printed. Time taken to name all the colors is note down. Scoring is done by means of getting Stroop effect score. The reading time and the naming time were converted into seconds. The reading time is subtracted from the naming time to get Stroop effect score. The subjects underwent one-to-one individualized yoga therapy session, which included 12 supervised sessions spread over a 3-month period. Each individual had a teacher who gave him/her a practice of asana, pranayama, and chants in a one-to-one individualized yoga therapy session for the duration of 1 h per se ssion. The rationale of the therapy was to facilitate flexibility, coordination, and range of movements with dynamic postures, incorporating breath regulations in dynamic and stay postures. Chants and breath ratios were included to enhance breathing comfort and mental focus. Yoga asanas with twists, forward bends, vinyasas (sequences) with long exhalations, and hold after exhalations were taught. Sitali, ujjayi, and alternate nostril breathing were also taught. Each participant had an individualized course plan, consisted of asana, pranayama, and chants designed for him/her according to their flexibility and mental capability, taught by the teacher and sheets were given to the individual to practice on their own at home. The participants were also given dietary advice in line with diabetic care guidelines. Diet advice followed the principle of “Hita” ahara, i.e. Satvik food consumption and “Mita” ahara, i.e. consumption of food in small quantity. Subjects were encouraged to practice the course at home and overall response rate was 61% at 3-month period. The data obtained on a sample of 91 subjects were analyzed to examine the descriptive profile at baseline. [Table 1], [Table 2], [Table 3] present the baseline demographic, clinical, and psychological status of participants. Mid-intervention feedback revealed a significant level of improvement in sleep quality, satisfaction with the individualized approach to training, better energy, relaxation, and physical functional quality. At the end of 10–12 individualized yoga therapy sessions, all the subjects were assessed for posttest on all the parameters, which were taken as pretests. The quantitative data on psychological variables were analyzed using paired t-test and Wilcoxon paired rank test was used for clinical indices. The results were compared with the pretests and presented below. 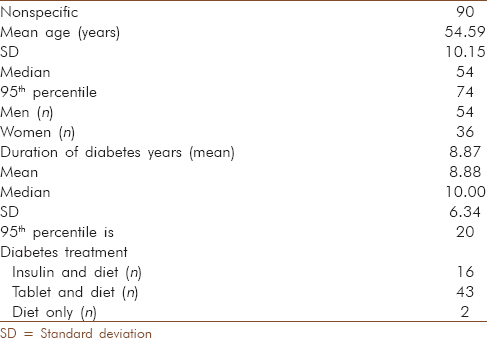 ADDQoL - [Table 4] presents perceived impact of diabetes on life domains before and after yoga intervention. The onset and progress of the diabetes condition to a large extent challenges the existing lifestyle and demands a readjustment. The negative scores on the domains indicate the interference of disease in otherwise considered being a normal life. The audit of the perceived impact of the disease post training indicates a significant reduction in the negative orientation toward the disease and associated issues. The major impact is perceived in the areas of food choices and feeling comfortable in following the diet regulations after the yoga practice. Yoga facilitates the adoption of healthy eating and mainly reduces the worries associated with diet adherence among patients (mean difference - 2.52, P > 0.01) and compared to baseline, 60% were more satisfied with a dietary regimen, which is an important quality dimension in diabetes self-management. The practice of yoga adheres to consuming “Hita” and “mita” aahara. The practice of asana and pranayama are likely to sensitize the awareness of individual to his/her food consumption and consequences. Apart from this, the other major concern is worry about the future. The fear of long-term complications and the course of disease can create tension and anxiety in the subjects. There is a marginal improvement with patients reporting less impact of disease on this worry, implying a level of self-confidence, a 70% reduction in worries related to diabetes is observed. Another domain of impact of yoga training was on the perceived improvement in the physical activities. The subjects could experience more physical flexibility, stamina, energy, and were able to understand that they can be physically active and take more challenges. Thus, yoga as a behavioral activation approach could positively impact this domain. The results of this study support that yoga is likely to enhance the perceived QOL among regular practitioners. 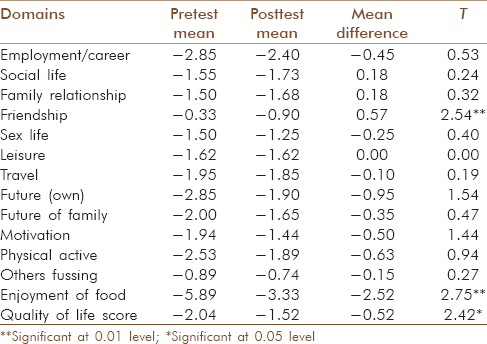 It is also observed that there is a significant reduction in the domain of “friendship” support perception by the participants. They felt the impact of disease to be influencing the social relationships. The practice of yoga has not shown any improvement in this domain. Depression was measured through BDI. Mild to moderate level of depression was present among 30% of the group. This was associated with the medical condition and thus had more somatic oriented complaints. After yoga practice, there was a significant reduction in the intensity of depression (mean difference of 1.66, P > 0.05), significant reduction in the depression frequency (mean difference of 7.58, P > 0.01). This indicates that the mind–body oriented approach of yoga can lower the negative thoughts and moods associated with “self.” Moods and also a process of behavioral activation associated with yoga practice can be beneficial in addressing co-morbid condition like depression among diabetics. Diabetes mellitus may accelerate the brain aging process, thus reducing cognitive reserve and the threshold for the development of attention deficit disorder symptoms. The brain is a target end organ in Type II diabetes and prediabetes. [Table 4] presents the scores of the subjects on specific cognitive tasks and also their own perception of the cognitive potential (self-perceived cognitive failure) prior to practice and after, to understand the role of mind–body technique in maintaining cognitive functions. Stroop color-naming test indicates an important executive function that is inhibition of irrelevant task and focus of relevant task. It is an ability to control impulsivity and delay decision to choose an appropriate response. This is called response inhibition. It also measures ease with which a perceptual set can be shifted according to changing demands and suppressing a habitual response. Only nine subjects had a score below 50th percentile indicating a difficulty for response inhibition. After training in yoga, there was a decrease in Stroop effect that is time taken to inhibit a response was faster, which indicates that impulse control was better. The magnitude of change was not large enough to reach statistical significance. Digit substitution task indicates processing speed, mental speed, ability to be task oriented, and cognitive motor translation. Intact processing speed is an essential cognitive reserve and resources for everyday problem solving in diabetic patients, especially in the setting of independent living and for mental wellbeing in aging group. On this task, the performance of the subjects remains same pre-post indicating no substantial changes. On the self-perceived cognitive failure such as distractions, forgetting names and places, and committing certain cognitive errors, there were no perceptible changes before and after yoga. Concentration test constituted of digit forward and digit backward span. This is a component of working memory, which requires attention to information (auditory-verbal), hold and process the information and respond. The average span of attention is 7 ± 2 for adults in digit forward component. Digit backward is little more complex and is likely to be affected by aging. Evidence suggests a discrepancy score of one between forward and backward span is normal. However, with cognitive decline, the discrepancy also increases. The concentration and attention span scores improved significantly both for digit forward as well as digit backward. The magnitude of improvement was higher in discrepancy score also. 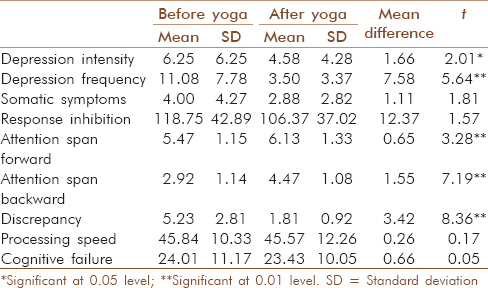 Prior to yoga practice, the mean discrepancy score was 5.23 and it reduced to a mean score of 1.81 at posttraining (P > 0.01) indicating the ability to focus attention and handle comfortably information in short-term memory. The role of mind–body focus and breathing strongly addresses the concentration and attention process of cognitive factors, which are likely to be compromised in this clinical condition. Diabetes being a progressive disease affects the functional efficiency of certain executive functions. This preliminary finding points to the role of holistic yoga as a way to reduce the acceleration of cognitive impairment. 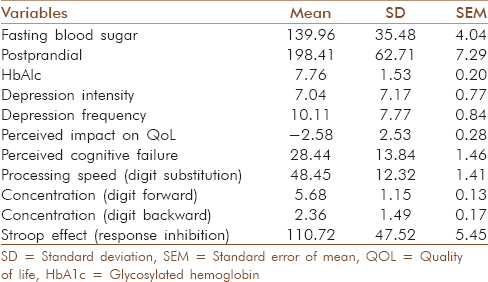 [Table 5] shows the mean scores on glycemic indices. The subjects showed a significant reduction in fasting blood sugar. This was observed in 74% of cases. In eight cases, the fasting blood sugar level increased during the 3-month period. The postprandial sugar level markedly reduced in 53% of diabetics and in 14 cases out of 30 it increased. This difference was not statistically significant. Exactly, 62% of the sample could achieve a better HbA1c level at 3 months period. This indicates that the changes in blood sugar level after practice is not uniform in all the participants. This can be attributed to heterogeneity of the sample in terms of age, duration of condition, type of food habits, and other lifestyle practices. This study is based on single group evaluation and thus lacks a control group. The responses of the subjects to the yoga practice were varied. The majority of the subjects reported a sense of subjective wellbeing and satisfaction with an individualized approach and felt that specific practices helped in better sleep quality, reduced daytime lethargy, reduced craving for food, improved flexibility, and breathing comfort. The results indicate that individual yoga practice can facilitate maintenance of cognitive alertness, positive mood, and enhance diabetic-related QOL. Compliance to yoga practice was 61% and there were no significant differences in the clinical profile, demographic profile, or psychological profile among the responders and nonresponders to the program on their baseline assessment. This suggests that the reason for dropout can be related to certain personal issues such as work- or family-related commitments, which constrains the participation and practice adherence. Yoga practice improved the awareness about food consumption and the adherence to diet, compliance with drug regimen and reduced negative perception of diabetes condition and improved mood among regular practitioners. There were no episodes of hypo- or hyper-glycemia. Adequate glycemic control was achieved over 3 months period for ten subjects whose HbAIc level was <7 at posttest. Yoga practice enhances subjective wellbeing and QOL among Type II diabetic patients, improves mood and concentration, and facilitates achieving adequate glycemic control. This project is an initiative of the Research Department of Krishnamacharya Yoga Mandiram (KYM), aiming to document the individualized yoga therapy in specific clinical condition (diabetes). Special thanks to the participating subjects who have given us an opportunity to learn and help. Rana Y, editor. National diabetes summit. Amritsar, Chandigarh: Times of India; 2013. Magesh P, Satish L. Cognitive quality of life in diabetes mellitus – Implications for cognitive assessment and rehabilitation. Int J Med Biomed Sci 2014;2:49-54. Brands AM, Biessels GJ, de Haan EH, Kappelle LJ, Kessels RP. The effects of type 1 diabetes on cognitive performance: A meta-analysis. Diabetes Care 2005;28:726-35. Fischer AL, de Frias CM, Yeung SE, Dixon RA. Short-term longitudinal trends in cognitive performance in older adults with type 2 diabetes. J Clin Exp Neuropsychol 2009;31:809-22. Shuba N, Karan. Assessment of the cognitive status in diabetes mellitus. J Clin Diagn Res 2012;6:1658-62. O'Connor A, editor. Diabetes linked to memory problems in older adults. New York: Times; 2012. Yates KF, Sweat V, Yau PL, Turchiano MM, Convit A. Impact of metabolic syndrome on cognition and brain: A selected review of the literature. Arterioscler Thromb Vasc Biol 2012;32:2060-7. Nazaribadie M, Asgari K, Amini M, Ahmadpanah M, Nazaribadie M, Jamlipaghale S. Cognitive processes and functions in patients with type 2 diabetes in comparison to pre-diabetic patients. J Res Health Sci 2013;13:208-13. Nazaribadie M, Amini M, Ahmadpanah M, Asgari K, Jamlipaghale S, Nazaribadie S. Executive functions and information processing in patients with type 2 diabetes in comparison to pre-diabetic patients. J Diabetes Metab Disord 2014;13:27. Malhotra V, Singh S, Tandon OP, Sharma SB. The beneficial effect of yoga in diabetes. Nepal Med Coll J 2005;7:145-7. Innes KE, Vincent HK. The influence of yoga-based programs on risk profiles in adults with type 2 diabetes mellitus: A systematic review. Evid Based Complement Alternat Med 2007;4:469-86. Yang K. A review of yoga programs for four leading risk factors of chronic diseases. Evid Based Complement Alternat Med 2007;4:487-91. Sahay BK. Role of yoga in diabetes. J Assoc Physicians India 2007;55:121-6. Sharma R, Gupta N, Bijlani RL. Effect of yoga based lifestyle intervention on subjective well-being. Indian J Physiol Pharmacol 2008;52:123-31. Chaya MS, Ramakrishnan G, Shastry S, Kishore RP, Nagendra H, Nagarathna R, et al. Insulin sensitivity and cardiac autonomic function in young male practitioners of yoga. Natl Med J India 2008;21:217-21. Gordon LA, Morrison EY, McGrowder DA, Young R, Fraser YT, Zamora EM, et al. Effect of exercise therapy on lipid profile and oxidative stress indicators in patients with type 2 diabetes. BMC Complement Altern Med 2008;8:21. Butler C. Twisting without shouting. A gentle introduction to the joys of yoga. Diabetes Forecast 2008;61:30-4. Alexander GK, Taylor AG, Innes KE, Kulbok P, Selfe TK. Contextualizing the effects of yoga therapy on diabetes management: A review of the social determinants of physical activity. Fam Community Health 2008;31:228-39. Aljasir B, Bryson M, Al-Shehri B. Yoga practice for the management of type II diabetes mellitus in adults: A systematic review. Evid Based Complement Alternat Med 2010;7:399-408. Cohen BE, Chang AA, Grady D, Kanaya AM. Restorative yoga in adults with metabolic syndrome: A randomized, controlled pilot trial. Metab Syndr Relat Disord 2008;6:223-9. Velupillai YN, Packard CJ, Batty GD, Bezlyak V, Burns H, Cavanagh J, et al. Psychological, social and biological determinants of ill health (pSoBid): Study protocol of a population-based study. BMC Public Health 2008;8:126. Skoro-Kondza L, Tai SS, Gadelrab R, Drincevic D, Greenhalgh T. Community based yoga classes for type 2 diabetes: An exploratory randomised controlled trial. BMC Health Serv Res 2009;9:33. McCrimmon RJ, Ryan CM, Frier BM. Diabetes and cognitive dysfunction. Lancet 2012;379:2291-9. Bradley C, Todd C, Gorton T, Symonds E, Martin A, Plowright R. The development of an individualized questionnaire measure of perceived impact of diabetes on quality of life: The ADDQoL. Qual Life Res 1999;8:79-91. Glycemic control; individualized approach; psychological wellbeing.